All Mammoth basketball systems ship for free to the lower 48 United States. Bring home the most affordable, high-end basketball system available. 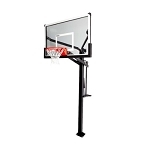 The Mammoth basketball line from Lifetime Products features a tempered glass backboard and either a 5x5 or 6x6 square steel pole. Rather than cementing the system into the ground, these basketball hoops use a sturdy steel, J-bolt anchoring system to provide optimal stability when playing. The strong breakaway rims hold up to aggressive dunking. The rim height easily adjusts up and down to allow young players an opportunity to learn the game. Order your Mammoth basketball goals here.